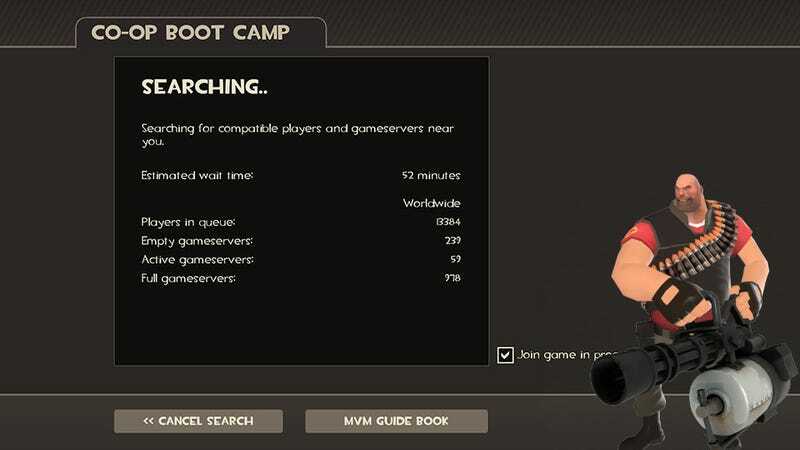 I've been seeing this screen a lot since downloading the Team Fortress 2 update yesterday, and I am not alone. With hour wait times, server connection issues and various other problems, Mann Vs. Machine co-op play is nearly unplayable. I say nearly because you can still grab a group of friends and start your own server. I made one by myself and it started up fine. Then the robots came, and destroyed me. But if I try to get into a community game server I get close to an hour wait. Obviously people are playing, but those people are not me, and they aren't many of the irate inhabitants of the Team Fortress 2 Steam forums either. In the forums players are also reporting long waits for the Mann Up servers, the premium $.99 per completed mission servers , indicating the wait starts small but goes on much longer than indicated. One user claimed to have been sitting at a 10 minute wait time for more than a half hour. I can't confirm this personally, however — when I tried to buy a ticket the store wouldn't complete my purchase. Take my money already! At least I can watch! Joining an MvM map on the server list works, but unless there are less than six people playing I'm stuck as a spectator. So far there's not much from Valve on the matter. We've reached out to the company to see if we can get some sort of update on when everything will be running smoothly, and will update the post should we receive a response. In the meantime, stick with your friends and you should (theoretically) be okay. If not, make yourself a sandwich and hope the connection doesn't time out.